Wasn’t quite the bombshell I was expecting, and hardly of ‘global’ significance, but interesting none the less. 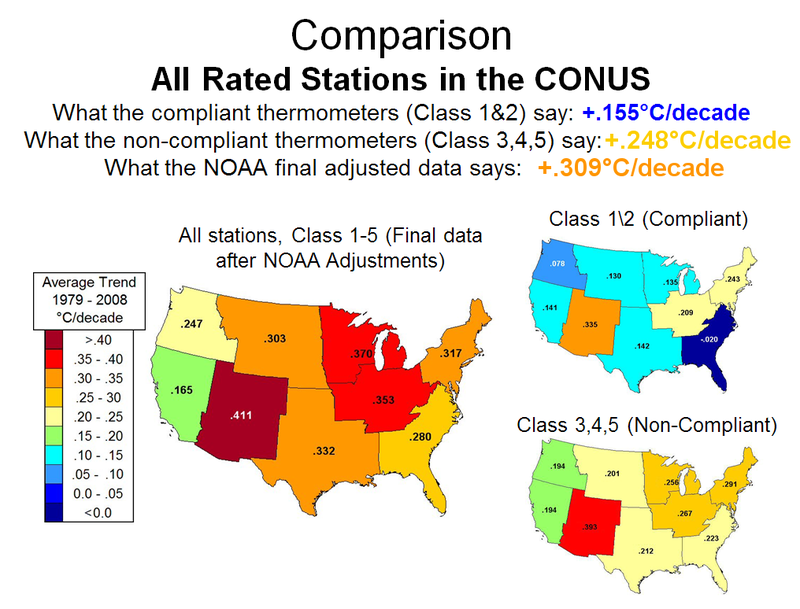 One particularly interesting point is that the NOAA adjustments increase the temperatures despite UHI effects. How can they get it so spectacularly wrong (unless there’s an agenda at work in the background – perish the thought)? Call me cynical, but maybe he’s worked out which side his bread’s buttered. Like I said in a post a while ago, the surface temperature sets are a crock. On that point, we have consensus. Just confirming what many people have known. Temperatures have gone up around cities, but down everywhere else! Its only HOT in the USA right now because We the People are boiling over to get rid of 0bama and his Communist Regime.!!! Wow, so after 250 years,two word wars,countless volcano eruptions ,above ground and below ground nuclear tests,country size bush fires and all other natural disasters the world temperature has changed by only 2.5 degrees Fahrenheit ( what is that in Celsius ? ), I would have thought that seven thousand million people breathing out would do that. The need to homogenise and rubberise scientific data, in any direction, only lessens its value. It’s the concentration and expansion of urban concrete and bitumen that affects ‘local’ weather. This was confirmed to me by a, now, retired senior meteorologist when I asked why there was a significant difference between the observations at the regional Bureau of Meteorology (BoM) station at the coastal airport and my own observations about 5km further West. Concrete and bitumen act as heat-sinks … hotter during the summer months and colder during the Winter months. Absolutely correct, and the amount of tar roads around the world keeps growing. So do we all buy 4wd vehicles and have dirt roads?. This question is too hard for the funded scientists to answer ,its easier to just tax people. Yes Colin, all the madness is based on UHI, not CO2. Many of the weather stationd used are at airports. FYI an sirport has a HUGE thermal mass in the runways, taxiways, and the ramp. Typical ramp temperatures of 155 deg F are seen. Quackery is prevalent in these reports. conversion errors eg integer °F to decimal °C rounded up. Cudos to those who called the connection with BEST. I am encouraged because the Watts et al draft paper confirms the statistical errors (that I didn’t make as a presumably dangerous post-grad back in the 70′s) and all my subsequent suspicions about the nature of the data regarding UHI etc. I’m sure that “Climate Change Inc.” will do everything they can to discredit this paper. You couldn’t have misunderstood the importance of this paper more! Basically, using the new globally approved classification, the amount of real warming that has occurred since industrialisation cannot be characterised as anything other than what we would expect from natural variability. Not unprecedented, not any deal at all! So apart from some localised UHI, move on, nothing to see here! Like I said, James, I was rushing to post something early before other commitments took over… apologies. I have updated the post. Simon, it took awhile for the significance of the new Watts et al 2012 paper to sink in for me as well. But it is possibly shattering for the warmist cause. It was interesting to see the comments today in the Age, poster after poster was making reference to Watts et al 2012 to discredit the warmist propaganda the article carried. The article also made reference to Watts and to Dr Judith Curry as dissenting voices. This is new territory for the Age. Usually they are a 100% unquestioning mouthpiece for the CAGW crew (But noting the article was still a skewed piece – just check the headline blurb about the reformed sceptic). I think some commenters are missing the point. The existence of UHI is pretty much universally accepted. What Watts et al have done is use state of the art methodology (accepted by the World Metereological Organisation) to re-evaluate the classification and weighting of weather stations. They have also demonstrated that the methods being used to produce ‘average’ temperatures are statistically flawed – instead of adjusting according to the most reliable stations, they have used the worst ones to taint the best ones. And, the bad ones outnumber the good ones about 2:1. The result is that all the stations getting jet engine blasts, in the middle of concrete carparks etc are treated as more indicative than those which are correctly positioned, leading to exaggerated warming (twice as much, in fact). This is the junk that has been fed into countless computer models. It is a remarkable achievement, and if validated will provide a robust methodology for similar exercises in other countries. Remember that temperature recording accuracy for most of the past century has been +/- .5 deg C. This is almost double the claimed temperature change. CRU’s averages to 0.001 deg are an utter farce. More measurements do not add to data accuracy. It is impossible to say whether there really has been any warming and certainly nothing to suggest man has effected anything other than UHI. That the trend is stronger in the homogenized data is no surprise, the transition to automatic weather stations during the study period has caused an artificial cooling in the raw data. For a bit more detailed “review”, please visit my blog. “How can they get it so … wrong?” Have you ever spent time with college or high school students who are replicating and experiment or among whom several teams are conducting the same experiment and have divergent results? One response is to “fudge” the data – “adjust” actual data to bring it closer to what it “ought to be.” Alternatively, if you have a team of scientists who are convinced that that they understand a natural mechanism, a mechanism which is complex and difficult to measure resulting in data of variable quality, and an adjustment system is developed to “fix” bad data, AND that system yields results that are in congruence with expectations, the easiest response will be to be happy with results. There is no motive to check to be sure the adjustment system is working properly. I have found critical flaws in commercial statistical packages implementations of extremely simple statistic measures, where the results “looked reasonable” but were simply wrong. There is no need to assume conspiracy or malfeasance where normal human inertia does the job. ACM’s response? “Call me cynical, but maybe he’s worked out which side his bread’s buttered.” Morano’s so-called “demolition” is a series of quotes from sceptics such as Lord Monckton, whose bread is buttered on both sides by the likes of Gina Rinehart. Muller was a supporter of AGW but in 2009 he became a sceptic (perhaps he read Australian Climate Madness – hooraaaaay!). He decided to see for himself, so he set up an elaborate research project that proved to his satisfaction that AGW theory is basically correct, even though he’d been funded by the Koch brothers. Seems to me that further research is needed in order to back up or disprove his findings.